Robovacs make at least one household chore a little easier, but with limited intelligence you can’t just tell them what rooms need cleaning. 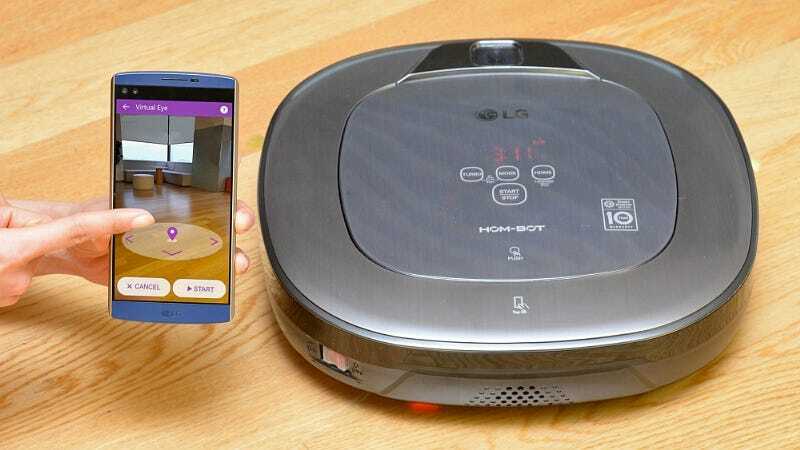 So LG’s HOM-BOT Turbo+ introduces a new feature which allows users snap a photo of their home and simply tap where the robovac needs to make another pass. The new Home-Joy feature is available through the HOM-BOT Turbo+’s free accompanying app, and the augmented reality that makes it possible is powered by three camera sensors that work together to image an entire room so that the bot knows exactly what area is being chosen in a photo. The cameras also allow the HOM-BOT Turbo+ to be controlled remotely from a smartphone when users would rather just take the wheel and direct the vacuum to the exact spot that needs cleaning. And for those who like the idea of a dog protecting their home, but not all the responsibility that comes with it, the HOM-BOT Turbo+ can also be set to sense movement when you’re away from home, and automatically send photos of the inside of your home when trouble’s afoot. Pricing and availability for the upgraded robovac haven’t been revealed just yet, but expect more details to emerge at CES 2016 in a couple of weeks.